Cannes is one of the most popular and glamorous resort towns in Europe, or the world for that matter. Many describe it as a breeding ground for the upscale and superficial. Cannes’ landscape and climate easily matches its extravagance and glitz. Backed by gentle hills and flanked by the Estérel coastal mountains in the southwest, Cannes is a haven for wealthy sun-worshippers. The city is blessed year-long with a warm but not blazing sun interrupted only by a cool, breezy winter. And its location on France’s Côte d’Azur brings with it long, curvaceous, and sandy beaches; it is no wonder thousands upon thousands including many famous celebrities make their annual flock to Cannes in search of their bronze tan. Cannes, of course, is known even among non-travelers for its celebrated International Film Festival in May. The Cannes Film Festival is a much publicized event, an occasion when the movie stars and the like descend the red-carpeted steps of the Palais des Festivals as seen by all on TV, while crowds of spectators swarm the perimeters hoping to catch a glimpse of their favorite “somebody”. But it is not just the Cannes Film Festival that attracts attention to the city; there is always something going on in Cannes whether it is a major business conference or convention, an international regatta or gala, or a professional golf festival like the Mimosa in February. And with the sight of luxury cruise boats coming in and out of Cannes’ Old Port, extravagant hotels like the Carlton along the beachfront boulevard, designer shops lining the town’s famous promenade, and five-star French restaurants galore, Cannes is definitely an upscale hedonistic escape that few can resist and so many continue to indulge. Cannes started out as an 11th century monastic village owned by monks who expanded their monastery beyond their nearby island of St. Honorat. The monks built a square tower on the top of the hill overlooking the Mediterranean front, which still stands today next to the Castre Museum located at the heart of Cannes’ Old Town. In the middle ages, Cannes developed into a small fishing village in Le Suquet, the city’s Old Town, on the site of a Roman military camp. The bay remained a fishing port until 1834 when an English aristocrat fell in love with Cannes and built a home to serve as his winter escape. His peers followed soon afterwards and Cannes quickly developed into a touristic haven for wealthy sun worshippers. This transformation was aided by the construction of the railway. In the late 1940s, the city installed the International Film Festival to rival a similar competition held in Venice. Since then, films have competed each year for the prized palme d’or, a trophy that has grown significantly in prestige. Today, Cannes is all about tourism and less about monastic life or fishing, although monks still inhabit the island of St. Honorat. The Palais des Festivals is probably a “must” of Cannes. It is the scene of the famous International Film Festival and where you’ll find the glorified red-carpeted stairs the stars ascend every year. The Allée des Etoiles (Stars’ Walk), which is the surrounding pavement, is much like that in Hollywood – enshrined with autographs and hand imprints of famous celebrities. 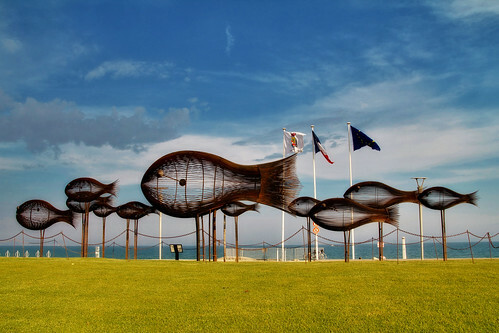 The famous mile-long waterfront promenade, La Croisette, is Cannes’ other “must”. This walkway actually starts at the western end of the Palais de Festivals and continues eastward. It is one of the most fashionable seaside promenades in the world, lined on its sides with palm trees and flowers and further out by private beaches, luxury hotels, galleries, boutiques and other expensive specialty shops. The main high-end shopping street, however, is at Rue d’Antibes about two blocks behind La Croisette. It is packed with clothing boutiques and fine food eateries including the lively morning food market, Marché Forville. The picturesque Old Town of Cannes is another worthwhile visit, set in the neighborhood of Le Suquet. At the Observatoire de Super-Cannes north of Le Suquet, you’ll find one of the most spectacular views of Côtes d’Azur. Le Suquet is also the site of the original Roman castrum or military lookout post. The Tour du Suquet or Suquet Tower, built in 1385 to guard against pirates, still stands there. At Le Suquet, you’ll find shops, cafes, and lovely Gothic stonework and narrow passageways that you can stroll through and admire. The hill is also crowned by an 11th century castle. There are few museums in Cannes and only the Museum of Childhood is perhaps worth visiting. It is dedicated to 19th century French history and includes a collection of antique dolls and accessories on display. Cannes has two casinos: the famous Casino Croisette, which is the most crowded and frequented of France’s casinos, and the Palm Beach Casino Club, which is more exclusive and high-end. The bar and club scene in Cannes is lively. Most of the hip bars and pubs are along La Croisette and are open all night long. It is not uncommon, especially in May, to find these venues frequented by celebrities. There are two islands off of Cannes: St. Honorat and St. Marguerite. A 4th century monk built an important monastery on the former, while his sister built a nunnery on the latter. The monastery on St. Honorat declined due to frequent pirate attacks and by the 18th century had become a “monks’ galley” for disgraced priests. On St. Marguerite, you can find a fort that was built by Richelieu and improved by Vauban. It is the place where Dumas’ “Man in the Iron Mask” was imprisoned.